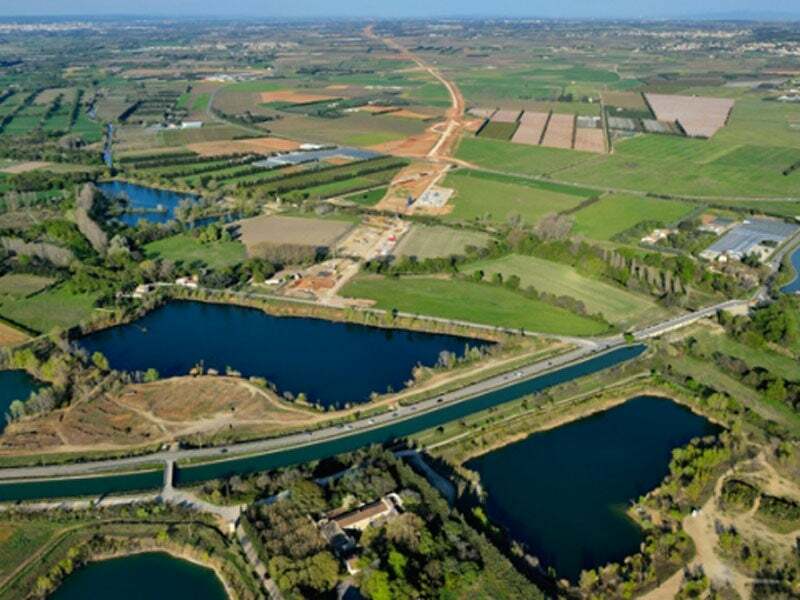 The Nîmes-Montpellier bypass is a mixed high-speed LGV line being developed in France. Image courtesy of Véronique Paul / Bouygues Construction. The project will include the construction of 80km of new line and will cater both passenger and freight traffic. Image courtesy of Systra. A new substation at La Castelle is being constructed to transform the power delivered by the energy supplier Electricity Transmission System. Image courtesy of Oc'Via. Construction of the Montpellier Odysséum (Montpellier Sud de France) station underway as part of the Nîmes-Montpellier bypass line. Image courtesy of Oc'Via. France’s Nîmes-Montpellier bypass, also known as Contournement ferroviaire de Nîmes et Montpellier (CNM), will be the first mixed high-speed Ligne à Grande Vitesse (LGV) line dedicated to both passenger and freight transport. With an investment of €2.28bn ($2.84bn, June 2012 estimates), the new line is expected to create approximately 30,000 jobs during the construction period. Expected to be completed in 2017, the project is anticipated to offset 3,000 trucks a day from the roads. SNCF Réseau (formerly Réseau Ferré de France (RFF)), the French railway infrastructure manager, is developing the project along with the OC’VIA consortium under a public-private partnership. The Nîmes and Montpellier bypass aims to provide passengers with more frequent regional train services (30% more regional trains) and reduce the travelling time for national and international trips. It is expected to provide improved regularity for regional services in the areas crossed, as well as decrease travel times for domestic and international passengers. The new link on the European high-speed network will provide access to the Spanish network via the Perpignan-Figueras line and to the Barcelona-Genoa corridor. It will also connect the Mediterranean high-speed line with the proposed new mixed high-speed line between Montpellier and Perpignan. The project is also expected to double the rail freight traffic in ten years, and aid in the development of the European freight corridor between Spain, Italy, and the North and East of Europe. The Nîmes-Montpellier bypass high-speed line (HSL) is part of a bigger project named Priority Project 3, which is being undertaken to create a rail network connecting Portugal, Spain and the rest of Europe. The bypass line falls under the Mediterranean segment of Priority Project 3, along with the Madrid-Barcelona and the Figueras-Perpignan lines. The key elements of the Nîmes-Montpellier project include the extension of high-speed rail network to the whole Languedoc-Roussillon region, addition of a new Montpellier-Perpignan line, and providing a link between France and Spain. The bypass project will see the construction of 80km of new line, including 60km of high-speed line between Manduel and Lattes, 10km along the right bank of the Rhone, and another 10km connecting Jonquières, Lattes and Manduel. It includes the construction of approximately 145 engineering structures, including seven viaducts. The maximum speed of trains operating on the line will be 220km/h initially and reach 300km/h ultimately for passenger trains, while freight trains will run at speeds up to 120km/h. The journey from Montpellier to Paris is expected to take less than three hours on the new line. Two new stations, Montpellier Odysséum (Montpellier Sud de France) and the Nîmes Manduel-Redessan, will be built as part of the project. The Montpellier Odysseum station is expected to be commissioned in 2017, while the new Nîmes Manduel-Redessan station is expected to be ready by 2019. The construction cost of the new stations, which is estimated to be €280m ($349.5m), will be borne by European Union and France (52% together), regional and local authorities (28%), and SNCF Réseau (20%). The new bypass line will be equipped with the European Rail Traffic Management System-Level 2, the standard train signalling and traffic management system of Europe. The first telecommunications equipment Global System for Mobile Communications – Railways (GSM-R) as part of the Nîmes-Montpellier HSL was installed at Saint-Gervasy and Codognan on 9 March 2016. GSM-R is the European standard for railway telecommunications. A new substation is being constructed at La Castelle to transform the high electric power delivered by the energy supplier Electricity Transmission System (RTE) and supply it to the bypass line. The maintenance base will be located in Nîmes and will comprise the operational and administrative centres of Oc’Via Maintenance. The project is being funded through a combination of public and private funding with OC’VIA contributing €1.5bn ($1.87bn). The public funding is being provided by the French State, Languedoc Roussillon Regional Council, municipal authorities of Nîmes and Montpellier, Gard General Council, the EU, and SNCF Réseau. A total of 11 commercial banks, including BBVA, HSBC, SOCIETE GENERALE, and UNICREDIT, are funding approximately €1bn ($1.24bn) to OC’VIA for the construction of the bypass line. SNCF Réseau entered a 25-year public-private partnership with OC’VIA in June 2012 for financing, designing, building and maintaining the line. The partners forming part of OC’VIA are Bouygues Construction, Colas, SPIE Batignolles, Alstom Transport, Meridiam infrastructure, and The Public-Private Partnership Investment and Development Funds (FIDEPPP). SNCF Réseau is responsible for the management of regulation, operational management of rail traffic and operation of the network and its technical installations. Oc’Via established two subsidiaries, namely Oc’Via Construction for the design and construction of the line, and Oc’Via Maintenance, which is responsible for the bypass project maintenance upon its commissioning. OC’VIA Construction awarded a contract to TERRASOL for conducting preliminary and detailed design studies for the project. TERRASOL also participated in the submission of the proposal for the HSL project, along with Natixis. Société Générale acted as the financial advisor, mandated lead arranger, hedge provider and security agent for the OC’VIA consortium. SYSTRA was awarded the HSL design and construction contract and is in charge of the integrated project management, along with SETEC, while Egis-group is engaged to provide project management assistance services. KRUCH is a specialist in signalling and catenary solutions for the railway sector, working closely with leading international rail infrastructure providers. The Train Conformity Check System (TCCS™) is a technological system that automatically detects 'irregular conditions' that affect rolling stock in transit. Ansaldo STS is using the latest satellite and telecom technologies to develop cost-efficient train control systems with greater flexibility, global adaptability and optimised lifecycle costs.